You can ride Megabus buses between New York City and New Haven CT, Hartford CT, Boston MA and Burlington VT.
Megabus operates buses between Boston MA and New York City via Hartford and New Haven CT, between Boston and Burlington VT (Burlington International Airport), and Boston to Portland ME. 12 or 13 buses daily make the run between Boston and Hew York City in 4.5 to 5 hours. Fares are usually $10 to $35, one-way. Megabus Boston departures and arrivals are via Gate 25 of the South Station Bus Terminal in Boston. In New York City, Megabus New England departures are from 34h Street between 11th and 12th Avenues in Manhattan, three blocks west of Pennsylvania Station across from the Jacob K Javits Convention Center. Megabus arrivals in Manhattan are at the corner of 7th Avenue and 28th Street. For full information, reservations and ticketing, visit the Megabus website. 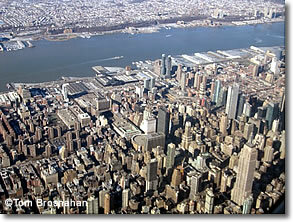 Want help deciding which mode of transport to use for travel between Boston and New York City (plane, train, bus, car)? Click here!